The previous track presented two interventions to increase concentration or decrease memory loss due to depression. They were the Zen and Rubber Band Methods. This Track will provide you with two more Cognitive Behavior Therapy interventions to increase your client's concentration and decrease memory loss which results from depression. SQ3R incorporates much of what is known about remembering and forgetting. Like the Zen State described on the previous track, SQ3R helps your client focus on the task at hand, rather than maintaining a depressive mind set. The steps in SQ3R are Survey, Question, Read, Recite, and Review. Darren, a 40 year old college freshman, used this technique to improve his study skills. Darren's wife, Catherine, and two children had been killed by a drunk driver while Catherine was driving their children home from a dance lesson. One month prior to the accident, Catherine had received a small family inheritance, which they had planned to put into a college fund for their children. One year after the accident, Darren, a real estate salesman, had decided to go to a local business college to get a degree in accounting. Because Darren had been out of school for quite some time, along with the depression due to the loss of his wife and two children, it was hard for him to concentrate on school subject matter. Prior to the loss of his wife and children, Darren described himself to me as being sad most of the time. As a matter of fact, Darren's statement during the session "Sad is how I am," became the title for this home study course. Do you have a client you are treating or have treated that could have made this same declaration? "Sad is how I am." Have you had a client return to school in later life? Or, have you counseled an adult or child client who is having problems with some type of course work? See if the method I used can assist you. Darren stated his frustration regarding course work in a session, "I just cannot get this school stuff; I'm too old. I don't care about anything, anyway, without Catherine and my two girls." --First, skim the material to get an overview. If something seems important while you are skimming, make notes on what you want to remember. This will give your mind a blueprint to work from. --Second, after skimming, ask yourself specific questions about what you've just skimmed over. This helps you focus your attention and give meaning to the material. Ask yourself, "What were some subheadings, graphs, or photos I noticed while skimming?" --Third, read the material in detail now, rather than just skimming. --Fourth, recite what you have just read. Ask yourself what you have just read. --Fifth, in the last step, recall. After you have skimmed, questioned, read and recited go back to the first section you read and ask yourself to recall what you can from the previous section now that you have covered additional material. Is this a strategy you might use with a child you are treating who has problems with school work? The SQ3R method helped Darren increase his memory enough to make passing grades in his college courses. This method not only helped him to get passing grades, but also elevated his depression by serving as a means to rebuild his life after the loss of his family. Regarding children and depression, a colleague of mine, Jill, was treating Sarah, a Junior High student, who was having trouble concentrating on her studies. Instead of concentrating on her teachers, she ruminated about her parents' arguments. Sarah thought she was stupid because of her F, D, and C- grades. She was surprised at the suggestion that part of her difficulties in school might be because of her worry and depression regarding her parents' constant arguing. Jill suggested an experiment. Jill would read a paragraph from Sarah's schoolbook and ask Sarah questions. Jill did this, and Sara was easily able to answer the questions. This proved to Sarah that she could concentrate, at least for short periods of time. If your client has a problem with concentration, you could consider the egg timer method. Jill bought a kitchen timer. When Sarah saw it, she said, "That's what my mother calls an egg timer." 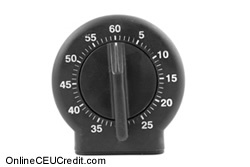 Jill used the egg timer in their sessions to increase Sarah's length of concentration time. Starting with 2 minutes, Jill gradually expanded the time to fifty minutes. Soon, Sara was able to study normally. Of course, treatment of the entire family system was needed to decrease the parents' arguing, but until that happened the egg timer method helped to bring Sarah's grades up to a passing level. Think for a moment. Could the Egg Timer focusing technique, and subsequent practice sessions, be effective in improving concentration and memory-difficulties with an adult or child you are currently treating? Have you found that many dysthymic clients report regaining their "power of concentration" very quickly, sometimes after only a few homework assignments, for example, six ten-minute practice sessions reading short newspaper articles for an adult or several pages of a textbook for a child..
Another hidden side benefit of the Egg Timer technique is that it provides a successful experience for the depressed patient. Can you think of a client that would benefit from being able to breakdown their depressive syndrome into concrete target problems? Problems that have concrete target solutions. Could you use the SQ3R method of Skim, Question, Read, Recite, and Recall, or Egg Timer concentration sessions for those who feel, perhaps, hopeless about overcoming their depression? I have found that sometimes the simplest CBT techniques can be the best tools for turning around depression. What would be a reason for using SQ3R and the Egg Timer? To select and enter your answer go to CEU Answer Booklet.